It's that time of year... it's time for THE CUP. 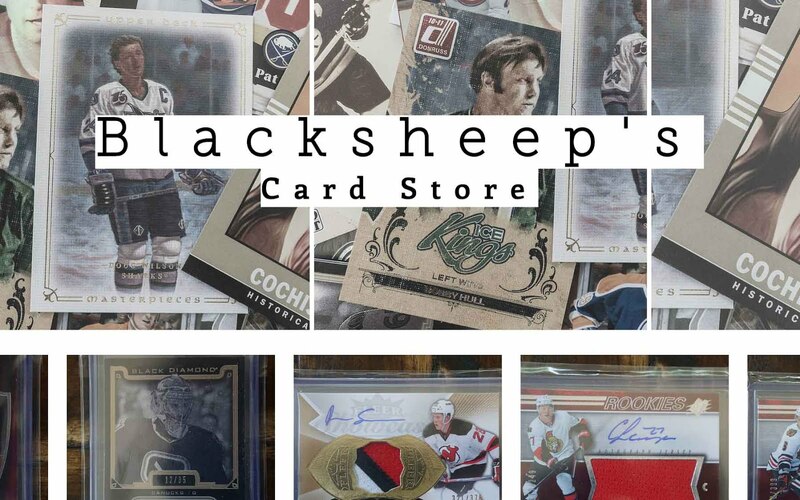 Upper Deck's mammoth release of the year is upon us, and collectors are already abuzz about what they can find in it. Opening up a tin of The Cup is really unlike any other card buying experience. You really have to experience it if you are at all into hockey cards. I am so excited for my yearly tin! Let's take a look at what came out of it. The Cup base cards come in their usual super-thick stock. 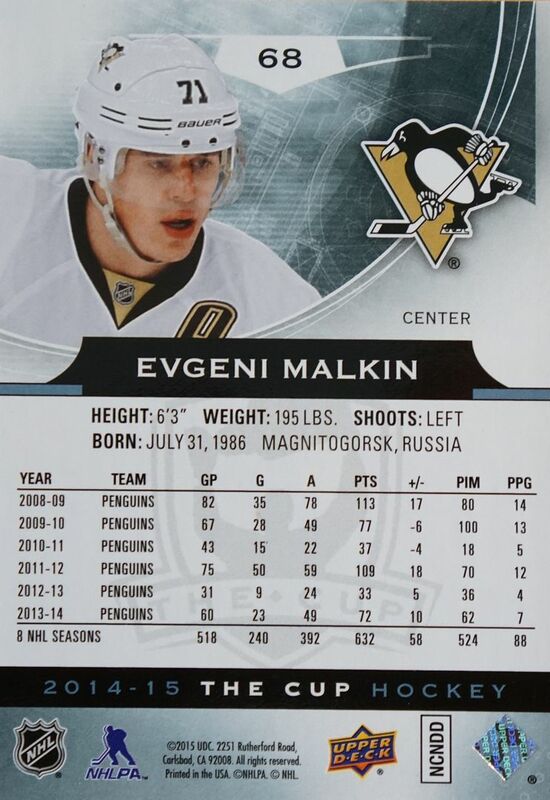 These base cards are pretty much like every other year of The Cup. I would definitely have a hard time distinguishing base card designs from year to year as they all look so similar. I think it'd be nice for Upper Deck to really change up the base design for The Cup to give each year a super-distinct look - just my opinion. The base cards are fine cards, but definitely don't have near the appeal of the real reason you buy The Cup... the hits! Nothing is too special about the back of the base card either. It's your standard back... not even a write up here! The design goes well with it's front-facing counterpart and everything is easily seen and read. There seem to be plenty of rookie patch auto cards from what I've seen of breaks. My particular tin had two. The standard rookie patch auto card is numbered to 249 and has a light blue design that, again, is very typical of The Cup. Unfortunately, these RPAs leaving me wanting. The color scheme and layout of the card is serviceable, but flat. There just isn't anything in terms of how they look that would really wow you. Like the base cards, I think Upper Deck needs to kick these into a higher gear next year. Each tin of The Cup will give collectors about 5 hits. Collectors will find on-card autographs, patches, and unique collectibles when they purchase The Cup. Every collector crosses their fingers when it comes to opening up a tin. We're all hoping for that massive monster to come out! Perhaps the most 'boring' of the hits has to be the jersey cards found in The Cup. These are just jersey cards like those you would find in the lower-end brands just with a much more limited numbering. 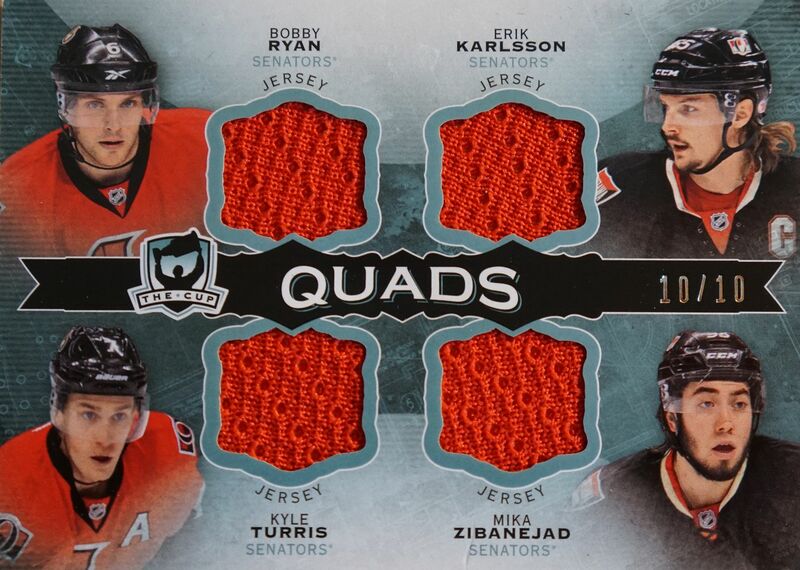 This quad jersey of four Senators is numbered to just 10. It's a very low number, but the card itself doesn't do too much for me. The patch version of this card might be interesting if the pieces of patch embedded were nice. 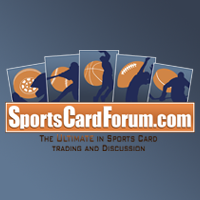 Brilliance cards combine some clear acetate on top of a foil team logo. The effect comes off pretty nicely, especially with the ice-blue pen used to autograph the card. My only gripe about these cards is that they are not serial numbered so it is difficult to determine how rare they are. My absolute favorite card from my tin was this amazing patch/auto of Teemu Selanne. The patch on this card is absolutely incredible! It's the center-piece of the Mighty Duck logo from an old Ducks jersey. That combined with the autograph make it a real winner of a card. I was very happy to find this unique piece. This is the kind of card you are hoping to get when you purchase something like The Cup. 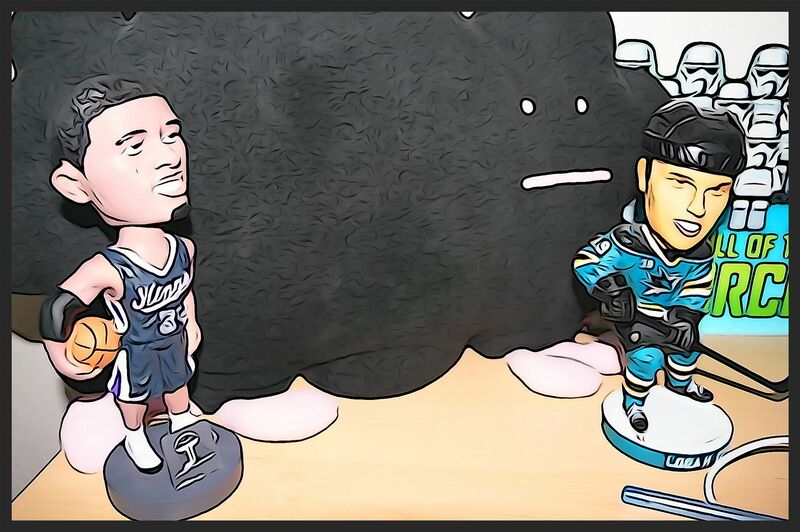 Of course there are many more different sorts of hits to find when buying into The Cup... way too many to write about in this blog post, that's for sure! I just suggest you take a look at some of the Cup breaks on Youtube. You may need a bib though... there will be a lot of droolage! At over $400 per tin of The Cup, there's a very steep hill to climb if you want to buy into it. It's definitely not a product that many can afford to purchase. For those who can, though, it's worth it to dip into it as much as you can. Like I said earlier, it's THE product you wait the entire season for. The good news is, for those who can't afford a tin, there will be plenty of nice Cup singles to purchase in the secondary market that won't cost you near the price of a tin. That would be a great way to enjoy cards from this set. Each year I am reminded about just how fun it is to pop open a tin of The Cup. It's hands down the best hockey product you can get! I really wish I had 400 bucks sitting around! 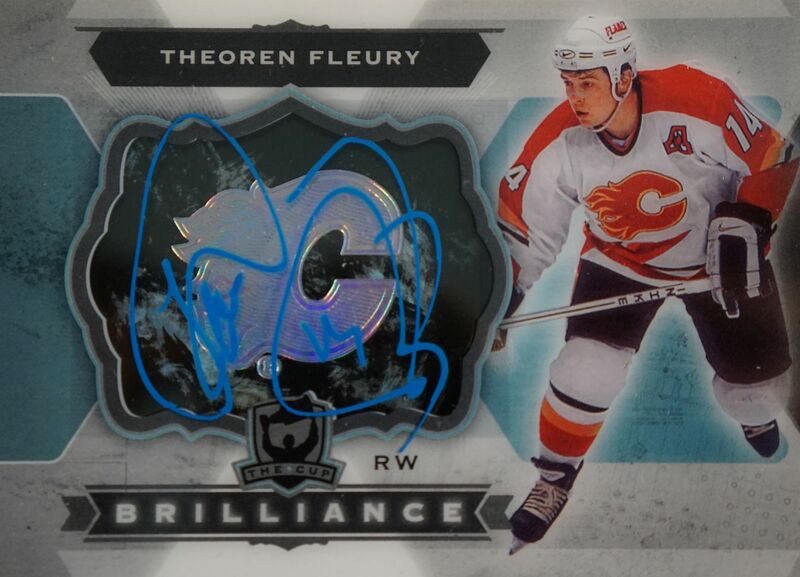 The Selanne patch is sick and nice Theo Fleury as well! That Selanne "Mighty Ducks" patch is absolutely killer! This year's Brilliance cards look cleaner than years past so they are great additions to any collection! Nice box break as usual Luke! Wish I had $400 to spend on a damn box.. lol Anyways that Selanne card is awesome! I love the Theo auto too! Wish I had 400 bucks to gamble. That being said, that was an unreal selanne patch. Glad they left that atrocious design of 13/14 cup in the past. Really nice review and a assome selane! 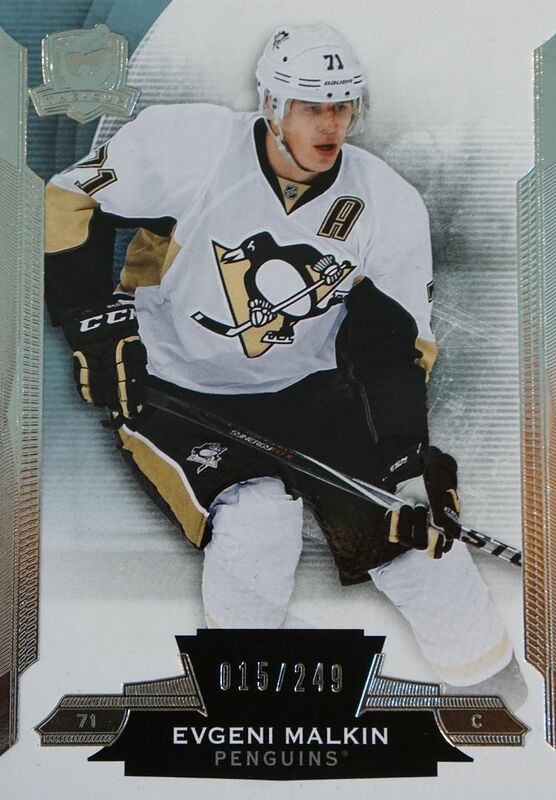 The Cup are my favorite hockey card because of the hit but it's to expensive for me. The base card have not a nice design. Hey Luke. Nice box I really like how you take the time out of your day to come and give a nice description of each of the cards. I watch all your videos! Keep up the good work! Love this box nice teemu. Nice Box! I wish I could afford it! Nice review! Cool Selanne patch! 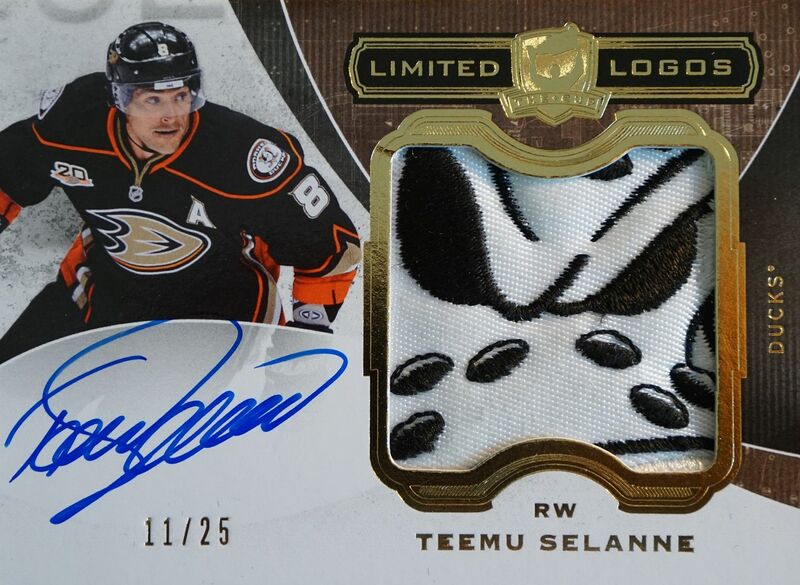 That patch/auto of Teemu Selänne is too sick. Man that Selanne card was sick, I think it is worth 50 to 100$ right now. Really nice product and amazing hits, wish it was cheaper xD. Wow, what every hockey fan and player strives for... "The Cup!" Nice review and really awesome Selänne! In a product with this kind of price tag you expect perfection. Especially since the price has gone up even more, at least in my country. + There's plenty of sick cards, including stick pieces, great patches etc. - With a lot of rookie cards in the product, there's also a lot of event worn material. A tin of The Cup should include 100% game worn material! 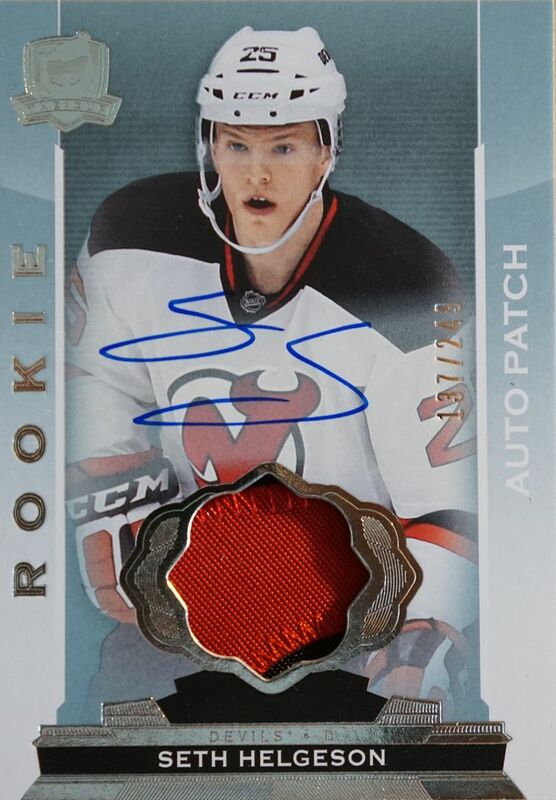 - It seems to me that the rookie auto patches has gotten smaller patch pieces, while the design definitely isn't better. That's a shame!